This is a city of ghosts, a place rich in macabre history that tour guide Leanne revisits twice nightly as she leads interested parties to the Hanging Yard, the Witching Pool, the Screaming House, and the ever-mysterious catacombs. Unfortunately for Leanne, the ghosts here are all too real, and as an ancient force that has been lurking and growing within the catacombs threatens to manifest, a ghost calling himself the Doctor soon becomes the most important figure in her life. ‘Ghost Walk’ does a great job setting the complex scene right from the start, and Fenella Woolgar gives an immense performance as a haunted tour guide who finds herself beset by a strange voice only she can hear as the darkly atmospheric world she works within suddenly becomes all too real. With intimateions of the mysterious Sabaoth returning heard, writer James Goss takes the intriguing approach of flashing back in time to the catacombs of the seventeenth century as the TARDIS seemingly hones in on a distress signal; however, frigid air encompassing stone circles and bones suggest that whatever presence the Doctor and his friends are looking for is a far more ominous one than originally expected, one that is able to draw the very energy out of everything around it, living beings and even the air itself included. The Doctor believing in a distress signal and Nyssa believing that perhaps the creature is communicating its fear by making her afraid are perfectly in line with the very optimistic nature of these two characters, but the reality of the danger they find themselves in hits quite quickly as even the TARDIS succumbs to the pervasive malevolent influence. With the companions resultantly separated, the stops on the ghost tour are suddenly given new meaning as Adric and Nyssa quickly find themselves threatened with death and as Tegan becomes an anchor for Sabaoth in her own right by having her consciousness thrust forward in time to an unsuspecting pair using a Ouija board. While this approach does somewhat lessen the actual time of direct involvement for Sarah Sutton and Matthew Waterhouse in particular following their respective vignettes, Nyssa’s bringing about a wonderfully touching relationship amidst an emotionally-heightened backdrop featuring Sacha Dhawan and Carolyn Seymour, it does serve to keep them crucially involved in the temporal progression of Sabaoth’s long game, and both give pitch perfect performances as they slowly come to understand where they have individually ended up and just how unfamiliar and dangerous these surroundings are. Both the slow-building threat of Sabaoth who knows precisely when there will be enough energy to physically manifest and the mysterious presence throughout the ages of the reclusive religious order known as the Brotherhood of Sabaoth work to wonderful effect and provide a true test for the Doctor to go up against that takes him to the very brink of death. Indeed, with neither Leanne nor the Doctor believing in ghosts, there’s a very interesting discussion about Schrodinger’s cat that applies to the mystery around the Doctor’s presence at one point, but the means by which the Doctor is able to piece together the temporal puzzle given Sabaoth’s abilities and actions taken are a testament to the intelligence of the character and the script. Although an established quirk of Time Lord physiology proves to be the ultimate basis for a successful resolution, Sabaoth proves to be a uniquely powerful and dangerous foe that highlights both Peter Davison and Woolgar expertly as the past and present collide and Sabaoth comes ever closer to manifestation and worldwide devastation. 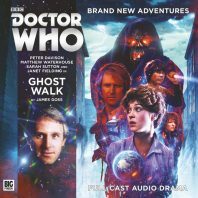 Overall, ‘Ghost Walk’ is a momentously tense an atmospheric tale that makes the most of its expanded TARDIS roster to highlight the long-standing and ever-increasing danger that Sabaoth- voiced so menacingly by Stephen Grief- presents. With a true sense of danger building throughout that is accentuated by eerily effective sound design, this is another strong release for Big Finish’s burgeoning 2018 Doctor Who lineup, and director Barnaby Edwards keeps the non-linear action flowing logically and sensibly from beginning to end to craft a genuine thriller. As an aside, a pseudo winking moment with mentionings of Peter Cushing films never hurts either.